I have wanted to do this post for a while, but various obstacles kept getting in my way. First my blog broke, and it kept redirecting, then the memory card I had the photos on decided to snap, and then last weekend happened and I just wasn’t in the fit state to do anything at all. Our family bathroom is the first room in the house, post-renovation, that is complete. Obviously the living room is already done (you can see our living room tour here), but that actually suffered a leak to the ceiling, which means it needs touching up paint-wise again. So, really, the bathroom is a bit of a haven for us. Especially for me. I like things to be ‘done’. I know that we’ll have plenty of time to make our mark on our home as we get older, and grow as a family, but I know we have months ahead on a smaller budget, with a newborn to adjust to, so we’re trying our best to sort things now. I’m rambling. On with the tour eh? The first thing I’ll say is that this is neither a small, or a large bathroom. I’d say it’s pretty fit for purpose. There’s room for a bath and overhead shower, a toilet, a sink unit, and extra storage, along with a towel rail too. We have lots of floor space, which will be useful when we have two kids to bathe, instead of just one, and I’m really pleased with how the extension went. This room actually used to be a solitary toilet. It was probably the width of a door, and felt like a long corridor to get to the loo. There was one small window (the one above the bath now) and it was dark, with a sloping roof, and not much to feel enthused about. Our actual bathroom, was on the opposite side of the house, where our nursery now lives. That’s still work in progress, but that has been extended to be a really decent-sized room now. But, for the purpose of comparison, even though the rooms have all switched about, below is our old bathroom. Complete with a green bath and some rather funky tiles. Looking back, I actually liked the tiles. 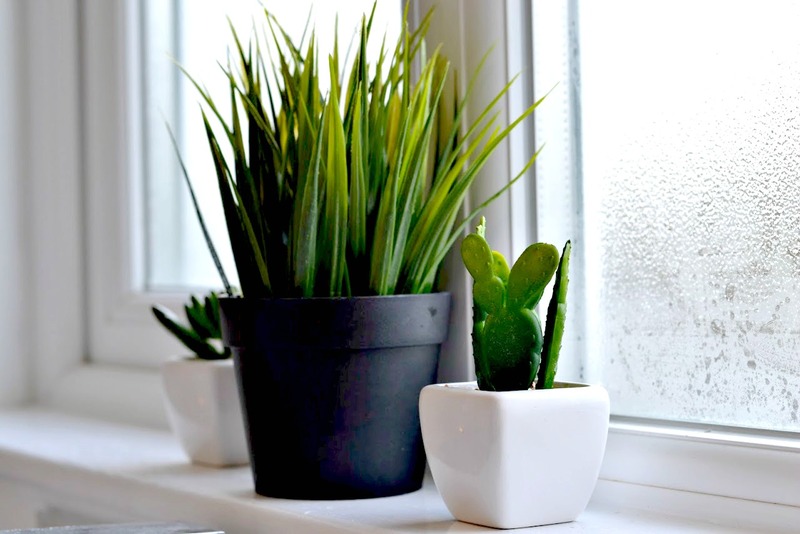 I like patterns and textures, and I do actually love green in the home. But in moderation. This bathroom was mouldy, grubby and very worn, and quite cramped too. But I appreciate it for being ours while we had it. Now, we have a much brighter and cleaner looking space. And I am pretty much in love with it. We decided to go for that monochrome style, mainly because subway/metro tiles, paired with a dark grout, have been an obsession of mine for a few years now, and also because, I feel like monochrome can really work in the bathroom. In some spaces, for me, it can feel quite clinical, or maybe a bit bare? But in here it says – come in, it’s clean, have a bath, there’s no spiders. And I’m down with that. We actually did this room on quite the budget, using a trade supplier, through our builder, to choose our suite. And keeping costs right down. 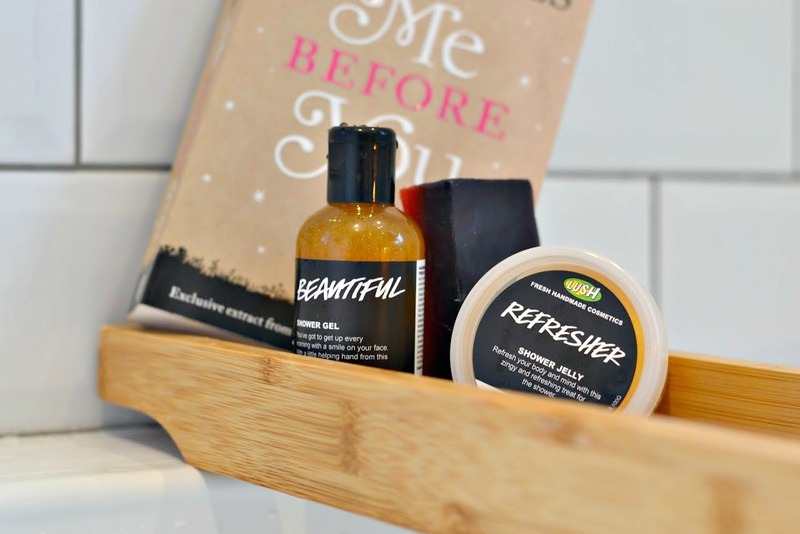 If you see my Pinterest Bathroom board, you’ll see I once had dreams of a freestanding bath and Moroccan tiles, but something had to give in the end when it came to our budget. I would really recommend seeing what your tradesmen can source for you. Popular stores like B&Q and Wickes do have great deals, but they can be timely (in my old house I bought an entire bath suite in the sale from Wickes and kept it in our dining room for six months before we fitted it). I found that I had some extra leeway when it came to budget vs. style when we went through our builders, and I actually feel like our bathroom suite isn’t one I’ve really seen before. 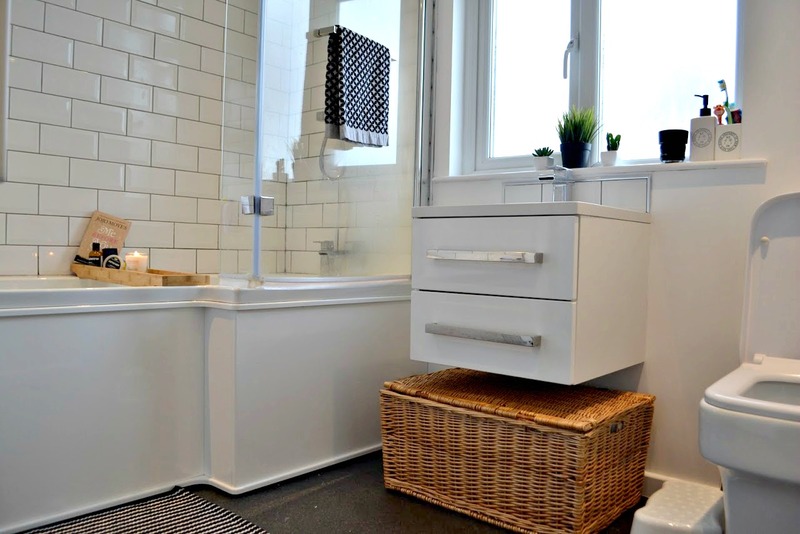 We ended up getting an L-bath (like a P-bath, but more angular in keeping with the tiles), a sink/storage unit, a toilet, a towel rail and another wall storage unit, all in the same theme, along with the tiles, for around £1,500, fitted. Obviously, there were other costs involved, such as building the actual bathroom, and plastering it, and adding windows, but that’s renovation work for you! One of the big things I wanted for this bathroom was a place for a family. Not a place where I felt attacked by bath toys, or a place where my kids sat in silence with a bath sponge for company. I wanted it to be ours. And I think we managed it really well. There are prettier elements for me and Mark, with a few succulents, plants and flowers dotted around. The bright green against the black and white really works for me. I’ve also added some natural shades throughout. With a wicker basket for extra towels, and a bath rack for the future glasses of wine I’ll be having in the bath, once this baby girl is born. I feel like this makes everything a little less harsh too. The hexagonal glass wall vases are from eBay, I’d recommend my seller but they have hoiked the prices up, so I’d have a search around. There are plenty to find and you can fill them with fresh flowers and water, should you want to. These flowers in shot above are artificial ones I already had, which I got from IKEA a while ago. Any extra touches, from toothbrush holders, to bath mats, to towels are all from H&M. I bought them just before Christmas, so there’s every chance that they are still available to buy. The reversible black and white patterned hand towels are my favourite. I absolutely love how they look! Artificial plant from IKEA, succulents from Wayfair. This is the wall opposite our sink and window. 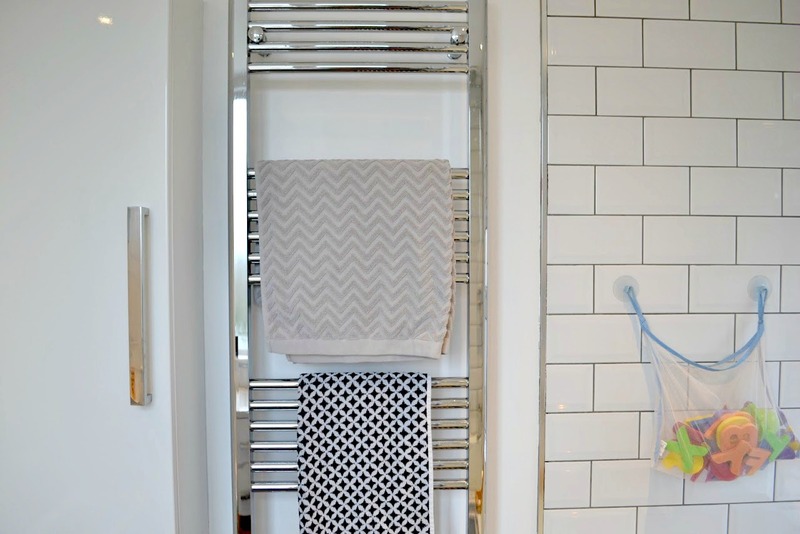 I love the towel rail, we chose the largest we could get, anticipating our growing family, and we all have some wall hooks on our bathroom door for extra towels or dressing gowns too. You can also see a toy box just below, where all of Bill’s bath toys tend to go. It’s plenty big enough, fits the theme of the room, and I love how bright all his toys look peeking out of the top! It also has a waterproof lining, so it’s great for this kind of job. And he pops all of his toys back in there when he’s done now too. This is also from H&M. As you can see around the bathroom, we have some gorgeous white skirting. I absolutely loathe painting woodwork. It’s my least favourite thing to do, but we received some primed skirting from The Skirting Board Shop. They actually supplied the skirting and architrave for all of our renovation work and having a pre-primed option meant that they only needed a quick coat of paint, leaving us free to soak in the bath for longer. I have to take a second to say a big thank you to Phil from The Skirting Board Shop who made sure the skirting we chose matched the rest of the skirting throughout the house, and he was brilliant at making sure I was happy. Another shout-out has to go to Alice, the PR, who was a pleasure to deal with and always ready to help. 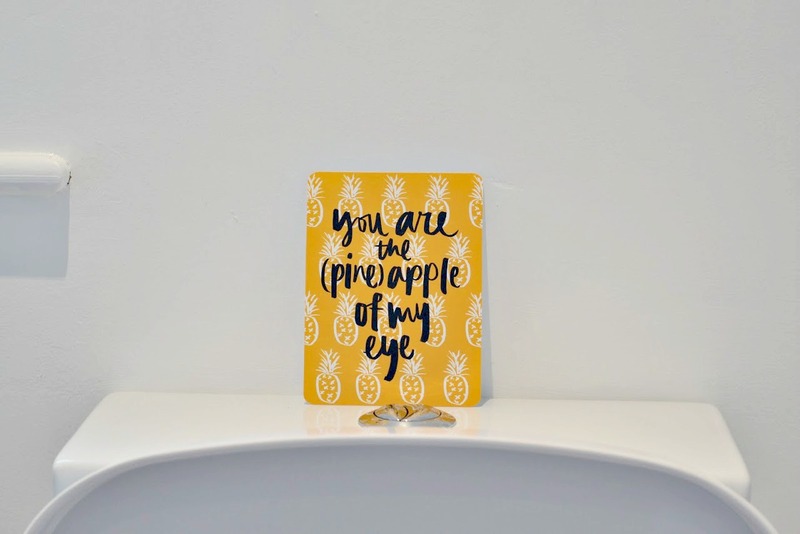 I don’t think we name and thank people enough sometimes, so I am doing in this instance as I think they are both brilliant and I’m really pleased with the product too. Now, the unit to the left of the towel rail is huge! 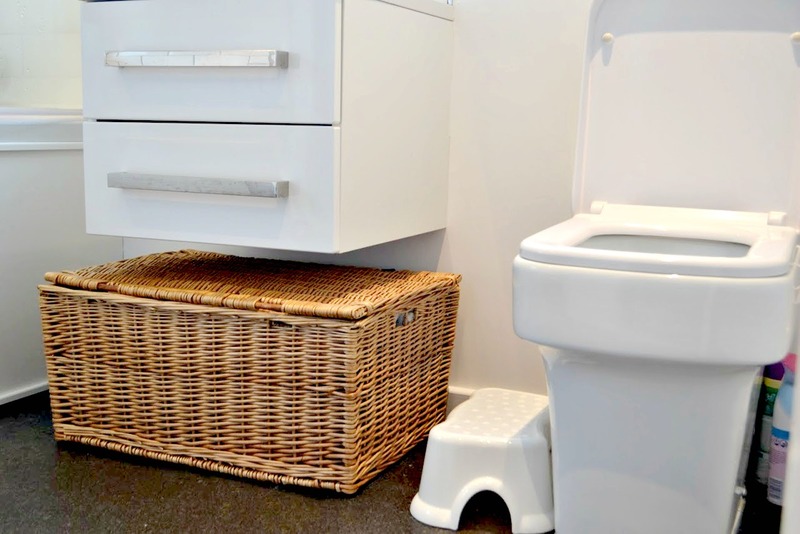 And brilliant for storing everything from extra toiletries, toilet roll and, well, tampons. I love being able to tidy mess away. Because that counts after a long day, when all you want to do is light the special White Company candle you keep just for the bathroom, and read a book. 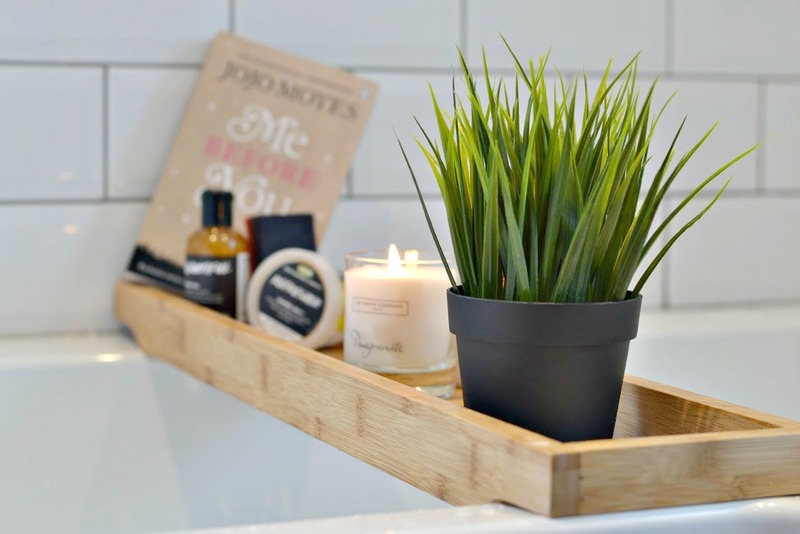 The bamboo bath rack was from eBay, and was a great steal and it’s perfect for me when I’m pampering myself, and it’s also perfect for dangling toy animals from for an animal rescue, or so I believe. So, there you have it. I’m really pleased with it – that’s probably obvious isn’t it? We’ve worked really hard to get to this point – I really wanted to give my children a lovely family home and I’m so excited to see it all come together. Baby steps though – you should see the state of the nursery. Watch the video tour over on Roost TV – make sure you subscribe! It looks fab! What a transformation! Gorgeous! Well done! I think I need that bath shelf, I've just dropped my phone in the bath ? I love it, looks brilliant! Totally like something that I would choose when we eventually get round to doing up our house. I want to have a another baby first! Will have to see if that happens, haha! Ahhh your bathroom looks amazing darling I love it. You decorate so lovely. Gorgeous! Well done! I think I need that bath shelf, I've just dropped my phone in the bath.